Nakedness is something you don't often think of when gardening. Not that I'm advocating naked gardening, time is cruel, and my mental image of myself is far from reality. 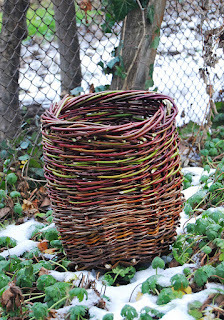 Instead, I'm talking about the beauty uncovered when plants shed there robes of foliage, as in the case of red twig dogwoods. 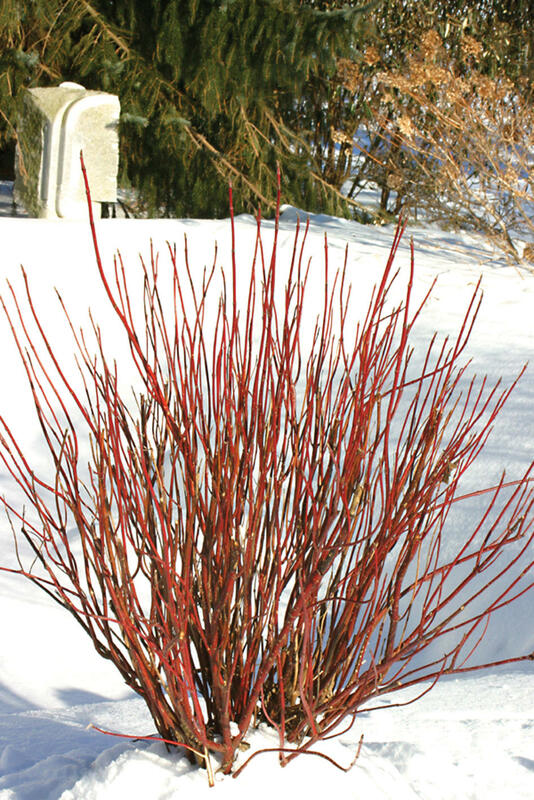 At this time of year, Red twig dogwoods morph from a fairly unassuming shrub into a thing of wonder as their foliage drops to show off their fiery red stems. 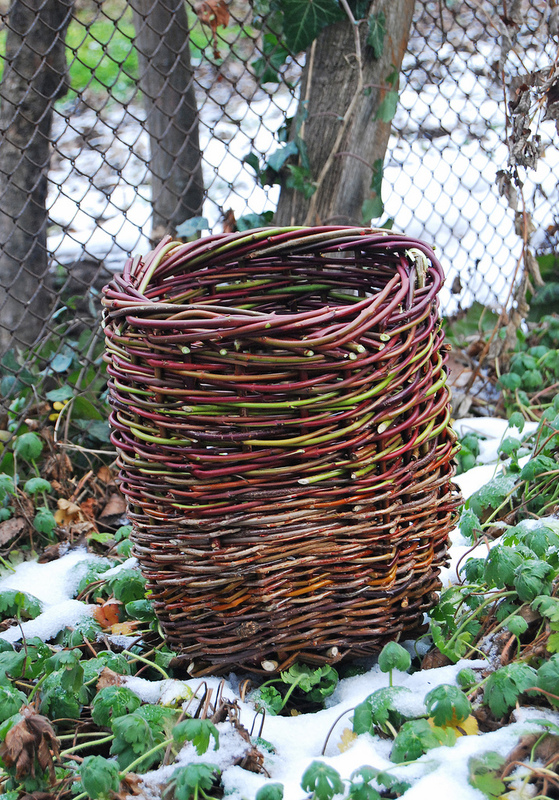 No longer a background shrub, it comes out of its cocoon to grab the attention of the observer, changing a dull winter into a festival of color. 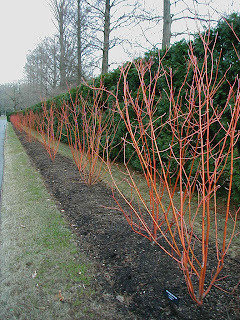 There are three types of dogwoods known for their show of vivid colored stems during the winter. 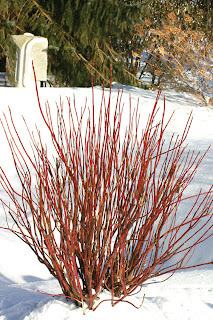 Cornus alba, the tatarian or siberian dogwood, Cornus serica, the redosier dogwood and Cornus sanguinea, the blood twig dogwood. The first two are fairly similar in growth and can be hard to distinguish apart when viewed by the average eye. Even for myself, the differences are so slight that I don't concern myself with the technical side but instead focus in on the aesthetics of what it can provide. The blood twigs on the other hand are quite striking and fairly easy to identify. Each group has its benefits, and in the interest of doing justice to each, I've broken the post into three parts so we can discuss them fully. The tartarian dogwood can be found from Siberia, down to northern China and into Korea, growing on moist, boggy locations. The common name 'Tatarian', is from of the ethnic group, Tatar, that live in the same area where this dogwood is common. The first plants to be grown outside of their range were recorded being sent to the Chelsea Physic Gardens in 1741, but was never admitted into the garden on account of its rampant spreading behavior However smaller, well mannered varieties were produced from that first introduction that did make it into western gardens. Historically, the stems of this dogwood have long since been used in weaponry with arrow shafts found dating back to the Mesolithic period. Its wood is extremely hard and has also been used for making cooking skewers and pipes to name but a few. Some reports also refer to its use in gunpowder. Charcoal, base ingredient made from dogwood stems is considered the best for small-arms powders. Dogwood charcoal was found to burn more rapidly than other woods, producing a stronger explosive to propel a round. Production of wood for charcoal processing could be done annually in a process called 'stooling' or 'coppicing' , where stems are cut down to its base in late winter. The plant would then regenerated its growth and be ready for harvest the following year, something that is impossible to do with tree type dogwoods. Below is a list of the varieties that I have seen come through the garden center during my time here. As you will see, the Siberian dogwood comes in many different forms making the selection process harder when deciding which one to use in your garden. 'Argento-marginata' or also known more commonly as 'Elegantissima', is one of the most popular variegated forms in the market. The cream white margin on the pointed leaf makes for an attractive show during the summer months. It is a large specimen, growing upto 6-7 ft but less vigorous than the species. 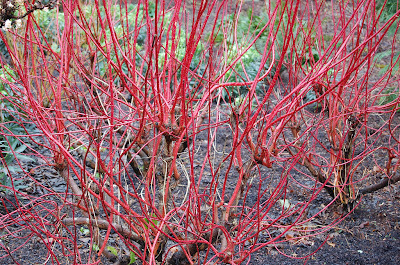 Like others within the group this is very controllable with pruning Fall color has a rosey red to add to its already interesting variegation but after leaf drop the vibrant red stem shine all winter long. 'Buds Yellow', not as widely used as the variegated form, 'Buds Yellow' offers yellow stems instead of the normal red seen in the species. Considered far more superior to our own canker disease prone C.sericea 'Flaviramea', this yellow form shows well when highlighted against snowy ground. 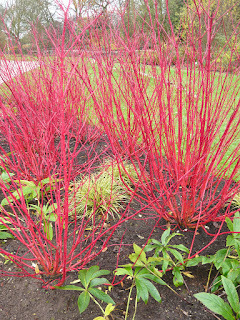 When combined with red stemmed dogwoods, the effect in the winter garden can be very dramatic. 'Aurea' and 'Prairie Fire' appears to be one of the same, both displaying a solid golden leaf. 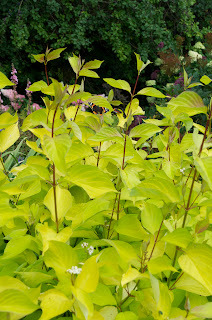 By summer, the color softens to a lighter yellow on the outer branches, but more chartreuse green towards the interior. Fall color fires up to a brilliant red before shedding. The stem color is a rich flaming orange-red in winter. With a range of attributes it's easy to see how versatile this variety is in the garden. 'Red Gnome' (Regnzam) is an extremely compact and low growing form (3 to 4 ft high, 4 to 5ft wide) suitable for any garden. 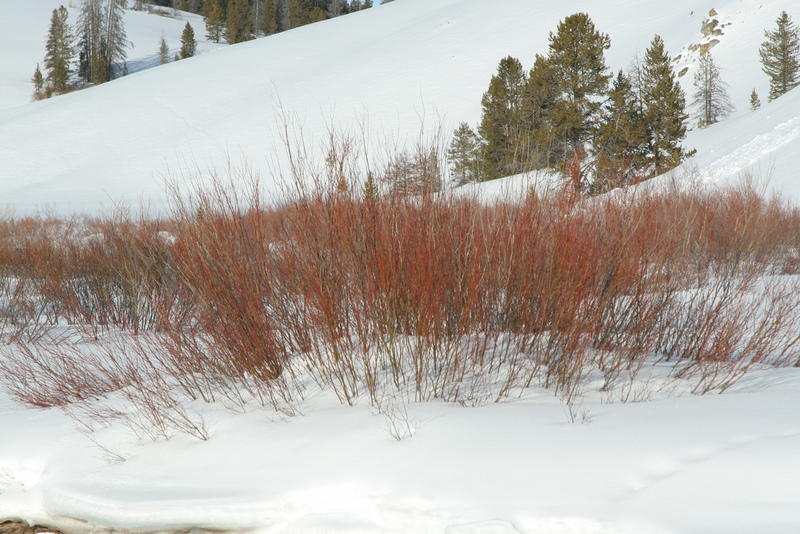 The slender green leaves turn a deep ruby red during the fall and give way to slender, upright red stems in winter. 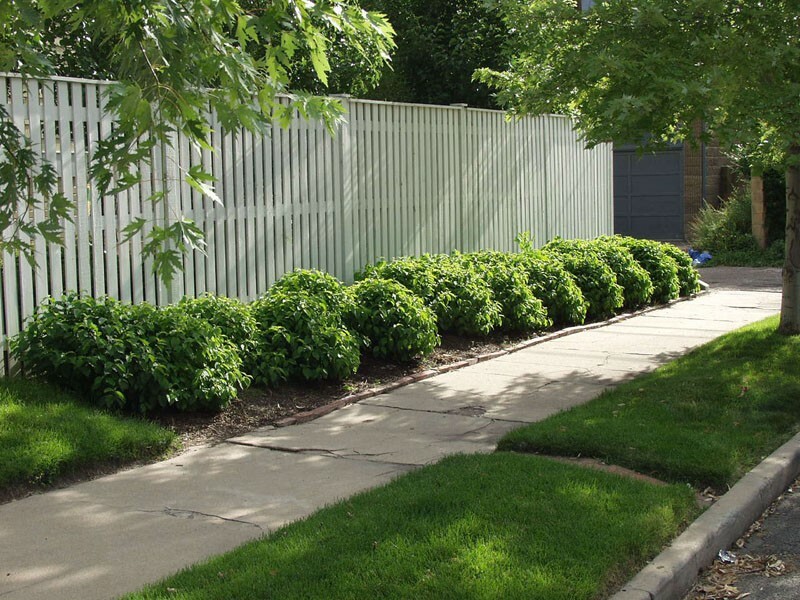 Its height and compact habit makes it useful for hedging. 'Sibirica' is a confused type, often being found named 'Westonbirt' or even as a different species called C.atrosanguinea. Either way this is still the most popular red stemmed type in production today. Foliage during the summer is a straight green and displays good fall coloration. 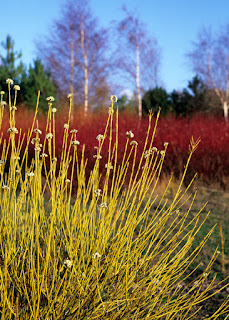 For anyone considering mixing yellow twigs with a red type, this would be the one to use as foliage color is the same. 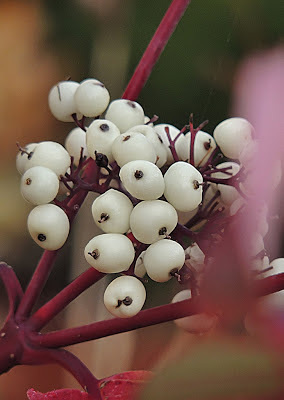 The coral red stems appear to be more upright and the berries are blueish instead of the normal white, common for the rest of this group, which may of lead to the confusion over its naming. 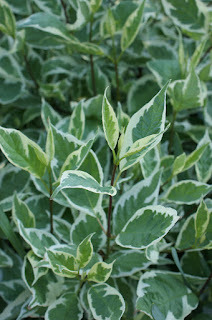 The Siberian dogwood is somewhat an easy growing plant that doesn't require anything special to prosper. It will tolerate wet locations and periods of drought once established and can take sun to partial shade. Young stems produce the best color, so in early spring cut back 1/3 of its growth within 6 to 12" of the ground to encourage new growth. These stems will shine the brightest in the landscape over the following winter until the next 1/3 to reduced back and allowed to regenerate. 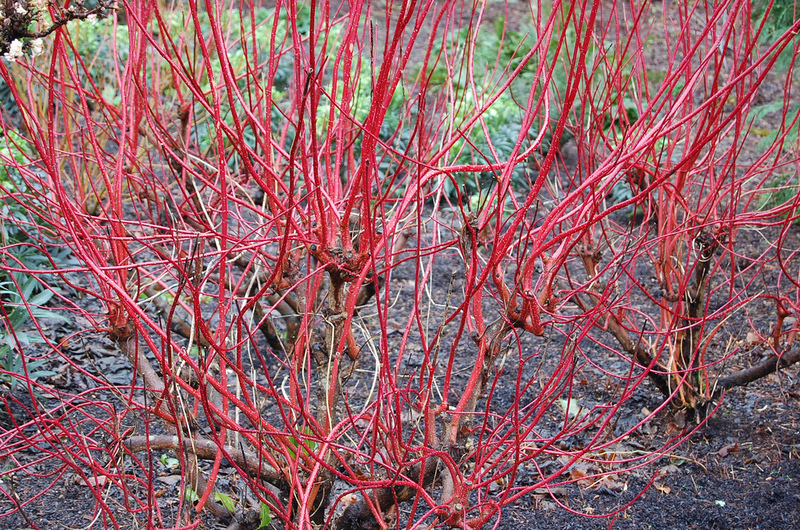 In part two, we'll take a close look at our own red twig dogwoods and highlight some of the top varieties that have emerged from that group. I hope I have intrigued you to stick around to see why a dogwoods bark can really lead to a bite! For us at the garden center, Thanksgiving marks the end of the garden shopping calender. The customers switch gears from working outside in the garden to hanging swags and trimming the Christmas tree. But, for a few who venture out into the quiet shrub sales area, you'll be greeted by the blooming event of Mahonia's. Often overlooked during the growing season, mainly because of its prickly holly like leaves, Mahonia's put on a show of bright sulfur yellow flowers that sprays out like water from a fountain. Though missed by fair weather gardeners, die hard types still looking for horticultural fix, get to benefit from this explosion of color. While the blooming season is magnificent, its habit and display of whorled frond-like foliage, makes for a year round, stately statuesque presence in any garden. The Mahonia family contains about 70 species often found in woodlands from the Himalayas, to East and Central Asia and into the America's. Commonly referred to as Grape Hollies, the blue-black semi-edible berries hang in clusters after flowering. Related to Barberries, Mahonia's have a bright yellow inner bark that contains an alkaloid called Berberine, which is responsible for the color. The colorant has long been used to dye clothing, wool and leather but is now being studied for its potential medicinal use in reducing cancer growths, lowering cholesterol and over coming insulin resistance. Mahonia x media (media - meaning middle, or between, referring to the mix of two parents) was a result of a accidental cross between Mahonia japonica and Mahonia lomariifolia that occurred naturally. Slieve Donard Nursery in Co. Down, Ireland was the birthplace of Mahonia x media, starting in 1952 with the discovery of seedlings showing slight foliage variations. Six of the seedlings were selected for planting by Sir Eric Savill, who at the time was Director of Forestry to the crown estate of Windsor Great Parks, in England. When these seedlings began to flower in 1957 it became evident that they were different from what the parent plants were. The first seedling to make it to market was named 'Charity',and can still be found to this day at Savill Gardens. 'Winters Sun' came from the same linage as 'Charity' and became registered in 1966 after it showed a greater dense, compact growing habit when compared to others in the 'x media' group. The bright yellow flowers also have a better fragrance, an added benefit for any early winter garden. I have seen 'Winters Sun' flourishing in an unprotected, full sun location with little sign of stress, provided it has good access to moisture during the hot summer months. However, all Mahonia's would favor the filtered sun of a cool, woodland garden. Once established, they can tolerate drought for an extended period with little consequence. In my garden, it has proved successful in deterring kids from jumping the fence looking for a short-cut around the neighborhood. Apart from that, it also works well on deer that also dislike it presence. Growing to a large 8 to 10 ft vase shaped form, it requires little pruning, though some stems can be reduced back after flowering to encourage a shorter, bushy habit. I have read some comments about Mahonia's needs to cross-pollinate to produce berries, though doesn't seem to be mentioned enough to draw a strong conclusion. It would still be advisable to include another specimen of its own species or one of a compatible species to ensure berry set. One reference I read highly recommended our own native Oregon Grape Holly, Mahonia aquifolium, a beautiful, lower growing species, as a suitable partner for Mahonia x media. Both 'Charity' and 'Winters Sun' are guaranteed to provide season round interest. Their architectural presence and explosion of color will anchor them as a focal point from which to design other combinations from. 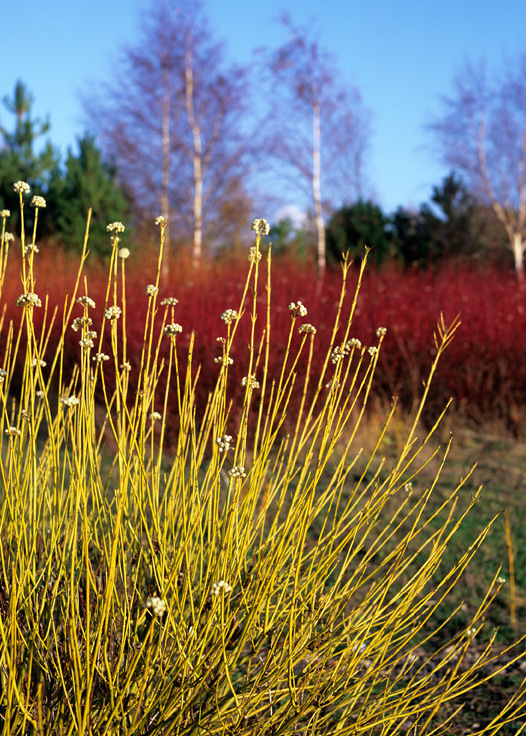 While it's not a shrub that will hug you back should you have the urge to show it some affection, it will grow into a loyal work horse of the garden, commanding respect while extending the season of interest, well into early winter.